Namibia women recorded a famous victory in the second day of play at the Buenos Aires 2018 Youth Olympic Games as they defeated Australia 4-3 in a late morning thriller. For all the day 2 results, click here. Captain Kiana-Che Cormack inspired her team with two goals whilst Joane van Rooyen and Taramarie Myburgh also grabbed a couple to earn Namibia their first win in Pool B. Elsewhere in Pool B, Poland edged Zimbabwe 2-1 in a close encounter while reigning champions China kept up their fine form as they beat Mexico 7-0. 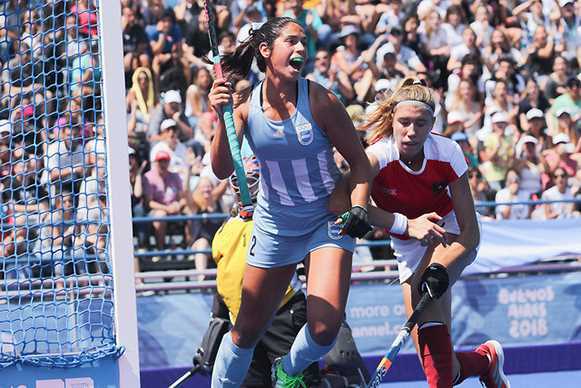 Women’s Pool A is topped by hosts Argentina on goal difference. They continued their high scoring streak this evening, this time defeating Austria 6-0 to the delight of the home crowd. The other matches in Pool A saw India make it two wins from two as they won 2-1 against Uruguay. However it was South Africa who picked up the biggest win of the day in the women’s event as they defeated Vanuatu 11-0. In the men’s competition, India continued their dominance as they beat Austria in Pool B. Four goals from Sudeep Chirmako helped them to a 9-1 win. Bangladesh meanwhile while pushed Australia to their limits, making for an edgy end to their Pool B game as Sawon Sarower brought the score to within one goal with three minutes to go. Australia however held on to take the 4-3 victory to maintain their 100 percent record. In the other Pool B match, Canada picked up their first win as they defeated Kenya 4-3 to continue day two’s excitement. Zambia captain Joseph Mugamba was the star of the show as his two goals helped his team to a 4-3 win against Poland in Pool A. The winning goal came within three minutes of full-time through Phillimon Bwali. Argentina remain top of Pool A however as they treated the home fans to 18 goals without reply in their win against Vanuatu. Every Argentine player except captain Lisandro Zago scored, including four goals each fom Ignacio Ibarra and Tadeo Marcucci. Hot on their tails at the top of the Pool are Malaysia who picked up their second successive win as they won 4-2 against Mexico. To find out who is playing on day three click here.